Home » Posts Tagged "Unmatched Features WordPress themes"
Finding a WordPress theme, which is seemingly a good and effective one is not a hard task to do, as there are tons of different WordPress themes outside. As one of the basic and reliable platforms, on which a successful website of any kind, type, nature or description can be easily launched and developed, Awesome WordPress themes are great in number and propose a pack of certain tools, options and features. So, choosing the right one out of them is the hard task. At first sight, is may seem confusing and bewildering to orientate and choose this or that one, but in case you have a closer and detailed look on each of the themes together with their proposed packages of features, as well as taking into consideration the overall professionalism, high-quality of the theme and the advantages of its features included, you’ll have a certain and clear-cut image in front of you. Keeping all the above stated points in mind, we are going to pick up the most reliable WordPress themes with awesome and unmatched features, so that it will be a great help to you in your business of making the right selection of theme. Cast a look on the list below and pick the most appropriate WordPress theme suitable for you! As properly can be judged by the name of this WordPress theme, Complete Pro can be considered a complete WordPress theme in all the possible appearances. All-inclusive, applicable, awesome and unmatched features of this theme can be a perfect solution for creating your website the way you want it to be. Complete Pro comes with slider with manifold effects, including animation, pause time, etc. , default slider can be easily changed and your preferred slider may appear on your website. The theme includes different ready to use and easy to manage sections on the homepage, customizer to undertake changes and check them easily, widgetized header, footer and sidebar, manifold ready to use shortcodes and still much more other useful features and options. Clean Pro is a clean and modernly designed WordPress theme with awesome and outstanding features. Clean Pro seems to be ideal choice both for individual and corporate usages. This responsive theme with full color changing options, widgetized sidebar, header and footer areas, , 580+ icon and 600+ Google font integration, easily manageable default slider with divers effects and features and compatibility with major devices and plugins is one of the most convenient and dependable all-inclusive themes, suggested at present. The next all-inclusive and adaptable theme armed with awesome and unmatched features and options is SKT Construction Pro. This theme can be used to cover diverse topics, ranging from building, construction, renovation, consulting activities up to any kind of other activity. This cross device and mobile compatible theme includes ready slider with the availability of adding up to 10 slides and with other options, theme color, background, font and image change availability, useful sections and areas on the homepage, standard pages and coding with HTML5 & CSS3. 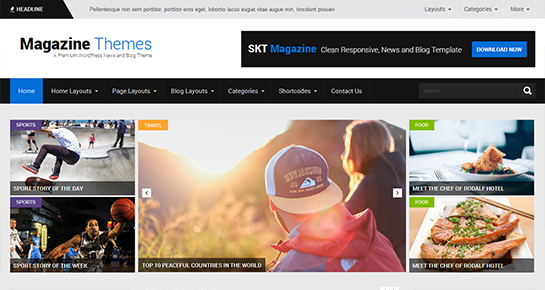 One more WordPress theme designed with super package of effective features is SKT Charity Pro. This responsive and adaptable theme, mostly suitable for charity and non-profit organizations, is developed in such a way, as to propose its users the most applicable and efficient elements, options and features. SKT Charity Pro includes changeable default slider, home, about us, blog, portfolio and other sections on the homepage to be presented with necessary information and images, header and footer areas with relevant contact information and social media icons, standard pages, lots of Google fonts integration, etc. Shopzee is modern, beautifully designed and functionally saturated awesome WordPress theme. Shpzee will meet all your requirements in connection to online presentation of your shop of any kind. The theme is responsive and fully compatible with WooCommerce, granting you a complete management and control to sell any kind of products. This full color changing and device and mobile friendly theme is presented with default slider to display the most appropriate images, products and the like, dropdown navigation with up to 5 levels, widgetized sidebars, footer and header areas, unlimited posts and pages availability and supports PayPal, Credit card and Mijireh payment methods. Another great solution for any kind of business presentation and shopping activity is granted by SKT Magazine Pro, armed with manifold extensive and unmatched features. Naturally enough, SKT Magazine Pro comes with the support of WooCommerce plugin for dealing with any kind of shopping-related activities. The theme suggests 11 blocks of diverse content styling and 5 different homepage layouts, out of which you can choose the most suitable one for your website, manageable sidebars and complete functionality with diverse popular plugins. SKT Design Agency Pro is another awesome theme with creative, modern look and unmatched features, which is worth our attention. With the support of this responsive and easy to use theme one is able to launch, develop and manage personal or corporate business website of any nature with ease. SKT Design Agency Pro, including up to 5 dropdown levels, controllable slider, widgetized sidebar, header and footer areas, standard pages and many other features and possibilities is Google mobile friendly theme and shows cross compatibility with all the major devices and plugins. Are you a girl or a woman looking for ideal WordPress theme with a whole package of awesome and useful features? Here is a complete and perfective Girlie for you, providing certain feminine touches and aspects along the theme design, which will be your best friend while covering any kind of feminine centered or related activities. Girlie comes with manifold suited sections on the homepage and valuable options for changing text color, size and font, ready beautiful slider with diverse elements, social media integration and is checked with WooCommerce and WordPress latest version. One more professional looking and highly customizable awesome WordPress theme with all-inclusive batch of features and characteristics is Yogi Pro. This theme basically suits to be a foundation of some fitness, yoga, gym or other relevant activity website or blog, however, the possibilities are not limited to those mentioned topics to be covered. This SEO and Google mobile friendly theme is presented with proper and fitting sections and blocks on the homepage, lots of icons, shortcodes and Google fonts integration, header and footer with contact information and social media icons and is tested with latest version of WordPress. The last one in our article is BeFit Pro, which also can be praised for its saturated and awesome theme feautures. Launched and crafted to face up with all the requirements for professional, popular and modern website presentation, BeFit Pro is also easy in usage and proposes manifold changes to be undertaken with little effort. This responsive and device friendly theme with black and orange colors emphasis in design comes together with home, about, being befit, services and other homepage sections, lots of Google fonts and shortcodes availability and conforms to SEO, SMO, WooCommerce and WordPress latest version standards. This entry was posted in wordpress themes and tagged Awesome WordPress themes, Unmatched Features WordPress themes on December 12, 2018 by SKT Posts Themes.